I've just finished off the first figure in the new Statuesque Fantasy range. In contrast to Ezmeralda Tyke, this new range will be very differently styled to my sci-fi figures. I really like Ezmeralda as a figure - I think she is among my best work - but due to her size, proportions and delicate features, she doesn't actually work with any of my favourite fantasy figures from other manufacturers. I realised after making her I prefer a chunkier, more caricatured figure in that genre. As such, I have never completed her gang of Malinquents. I also didn't really have a strong enough design for the other characters so she remained alone. She'll be going out of production when current stock sells out. There are a variety of reasons for this, but the positive is I can reboot the Statuesque Fantasy range to a style that will match my fantasy collection! 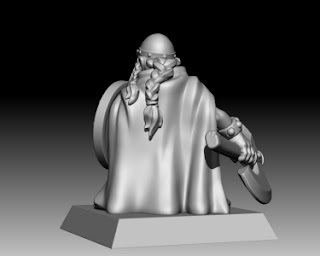 Anyway, on with the new figure... Lowri Lowrisson, Dwarf Adventurer! Yup, it's a dwarf. I make no claims to be reinventing the fantasy genre; I want a band of warriors in the classic Heroquest or Warhammer Quest mould, and no-one makes figures that are exactly what I want so I'm making them myself! The plan is for a dwarf (check), a wizard (in a pointy hat), an elf (with a bow) and a barbarian (ridiculously muscled). 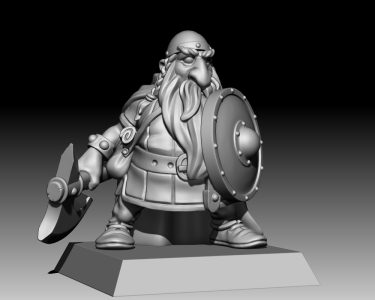 The other figures are all in progress and share Lowri the Dwarf's caricatured style and exaggerated proportions. It will take some time to get him on sale as it would probably make sense to release all four adventurers at the same time. I just wanted to share, as I'm quite please with how he's turned out! Nice work! A heroquest-ish adventuring party is a great way to start a line... but eventually they will need something to bash around. Goblins? Evil men? Trows! Or my take on Trows anyway - little, gobliny creatures. A long way off though! Oh my gosh... I cannot wait till this line is released. Completely agree on your aesthetic sentiments and look forward to the rounded out party. 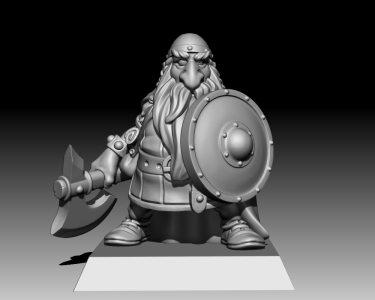 Great Dwarf - he's destined to slay minions on my dungeon table!. Cheers, Seb. 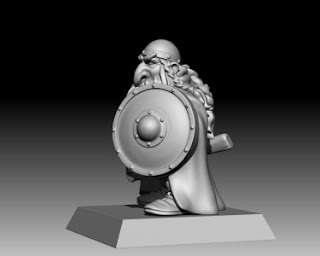 Your blog with all it's Heroquest and Warhammer Quest was influential in me wanting to sculpt some adventurers!